It was my first day in Russia and I couldn’t get more explanation why the city was closed since I don’t speak Russian. I didn’t know where I was until I used my i-Phone GPS, which gave me the direction to start walking. I could see the state-owned, ornate Church of Our Savior on the Spilled Blood in the distance so started the long walk. But on the way was distracted by large crowds entering a big Orthodox cathedral named Kazan Cathedral. I followed two deacons carrying banners. Being a Catholic deacon myself I recognized their liturgical garb, dalmatics with sleeves. The huge crowds parted as they entered thus allowing me to tag along. This is an active church not owned by the state. Inside were at least 5,000 people of all ages and genders standing packed together, praying, singing, bowing, and signing themselves with the cross. There was a constant stream of people from one service to the next, 5,000 out and the next 5,000 in. The streets were packed with worshippers. It turns out that the police had to close St. Petersburg to accommodate the tens of thousands in processions from all the Orthodox churches in the city, and there are many, that proceeded to St. Alexander’s monastery. 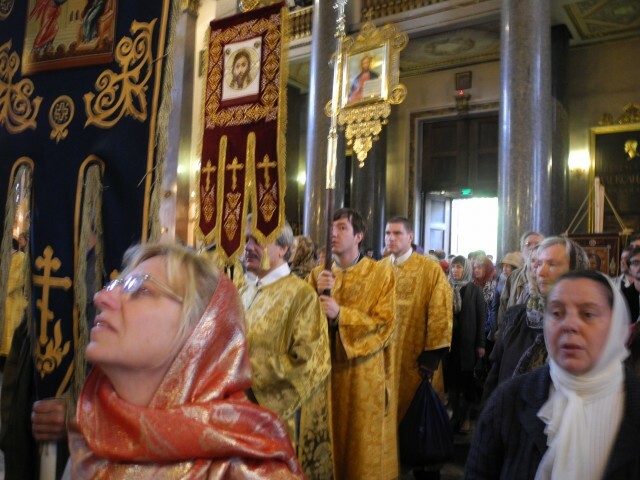 It was the celebration of the feast day of Orthodox St. Alexander Nevsky. What I was witnessing was the communist state relenting to the masses of Christians that had for so long been suppressed. But no longer! When open expression of religion is forced underground it grows stronger. I was seeing the true expression of why the city’s original name was returned from its secular name Leningrad. Secularism is not atheistic its god is government. And government ultimately is not enough to satisfy the transcendent yearnings of the human heart. This is not an event that will be reported in the Western press. I wondered why and whether it would ever happen in the US that government would excise religion from public expression? Will it be politically incorrect to have cities named St. Francis (San Francisco), St. Louis, The Angels (Los Angeles), et.al.? My second day had related meaning but I didn’t recognize it at first. I went to the magnificent Hermitage museum, a place that would take weeks to visit. But I was on a mission to see Rembrandt’s famous painting “The Return of the Prodigal Son.” One of my favorite spiritual authors, Henri Nouwen, was inspired by spending hours in front of the painting, before writing his book, aptly named: “The Return of the Prodigal Son.” The painting and book portray the classic parable Jesus told, which describes three characters. First the older son who has bitterness resulting from legalistically following rules and expecting a reward. Second the prodigal son who spends his father’s inheritance in debauchery only to come home to his father in humility, merely looking for love. And finally God the Father who lovingly rejoices over the return of His lost sheep, the prodigal son, without condemnation only with love. Henri shares that he and certainly most of us travel on our spiritual journey taking on the persona of each character with the ultimate goal of becoming the loving Father. Then it hit me, fortuitously the Gospel readings for tomorrow evening and Sunday, which are the same for many Christian faiths, are the parable of the return of the prodigal son [Luke 15:1-32]. Suddenly I saw the city as the older brother, Leningrad, lording over its people and then returning to the prodigal son, St. Petersburg, rejoicing in the love of the Father. The Russian Orthodox Christians are back in force.